Johann Nepomuk Hummel was a pupil of Mozart. A child prodigy himself, he developed a highly virtuoso technique on the piano, and built an impressive career as one of the most famous and sought after pianists and composers of early 19th century Europe. Even today, some of his piano works offer a serious challenge to professional pianists. Hummel�s piano trios are composed in the classical Viennese style, but already offer hints of romantic drama and passion. The instrumental writing is of the highest order for all three instruments. The piano trios are delightful works, full of brilliant virtuosity, charm and wit. 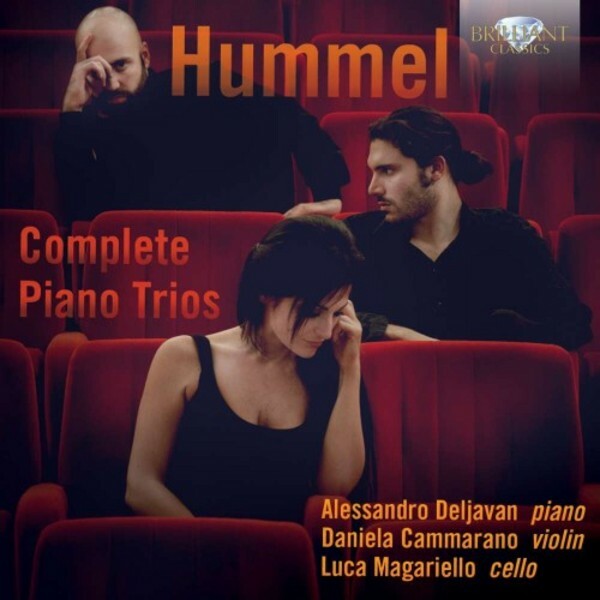 These are excellent performances, with a true understanding of the style, by three young Italians: pianist Alessandro Deljavan, violinist Daniela Cammarano and cellist Luca Magariello. Despite their youth, all have established careers behind them. With Deljavan and Cammarano having studied in Milan, and Magariello in Turin, the three musicians have all worked variously as soloists and orchestral players both in Italy and abroad, counting several international prizes between them. They are delighted to be collaborating together for this project, being enthusiastic performers of Hummel�s music and committed to bringing his extensive oeuvre to new audiences.